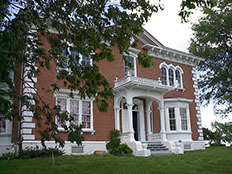 Linwood Lawn is said to be the first house west of the Mississippi to have hot and cold running water and a central heating and cooling system. The mansion still showcases its original Italian marble fireplace mantels, sterling silver doorknobs, Cornelius and Baker (now electrified) gasoliers, exquisitely detailed plaster frieze molding, and many other outstanding examples of the best architecture and craftsmanship of the time. 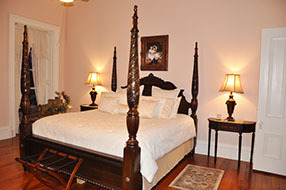 Even with 14 foot ceilings and 26 rooms, numerous guests have remarked about the surprising coziness and peaceful tranquility they experience within the walls of this beautiful mansion. 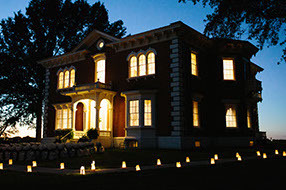 Plan a visit and see for yourself why Linwood Lawn is today known as “the finest antebellum mansion in the Midwest”. 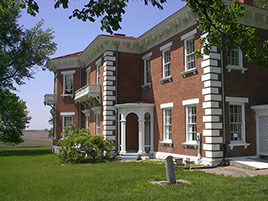 Linwood Lawn has been designated as a location on the National Historic Registry since 1973. 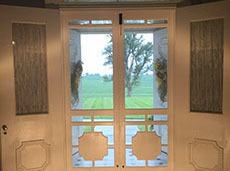 Having just undergone a loving three yearlong restoration, Linwood Lawn is available today for weddings, meetings, tours, bed and breakfast and many other events. 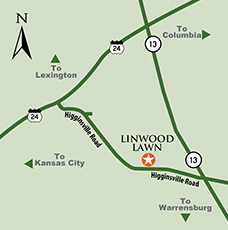 Whatever type of event or activity you might wish to host, the staff at Linwood Lawn will make sure it is one that you and your guests will long remember. inside, or on the grounds, of the stately grandeur that is Linwood Lawn.